Online slots today run the full gamut of quality and effort – from the simple ‘classic’ themed slots with a handful of basic icons and few effects to the rich 3D experience of games from Betsoft Gaming and innovative developer like Thunderkick full of neat animation, slick graphics and engrossing bonus rounds. 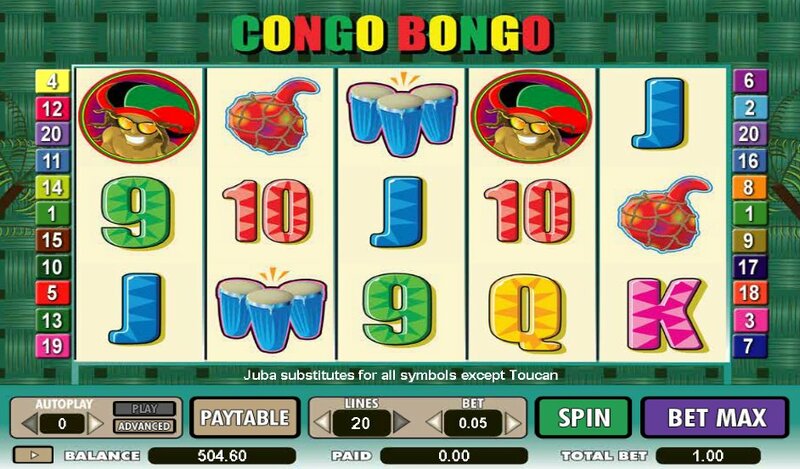 Amaya’s Jamaican-themed Congo Bongo most definitely falls into the former camp, and if you’re looking for something a bit different to your run-of-the-mill classic slot with a bit of a Cool Runnings feel to it then you've come to the right place. The game is a 20 pay-line slot played out over its five reels, and there’s a nice range of betting to cater for all slots wallets from $0.01 - $5.00 a coin. And with a $30,000 jackpot there’s certainly plenty to play for, even if there are minimal bonus rounds to actually play. As well as the regular 9-through-Ace symbols there are plenty of exotic looking symbols on the reels like some oil drums, bongos, a tambourine, a toucan and other musical instruments. The Rasta is Wild and he substitutes for all symbols other than the Scatter. Five Rastas pays a fantastic 6,000-coin jackpot. 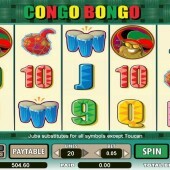 Winning combos animate (to a fashion), especially if you hit the Rasta in a winning payline. Other than that there’s not much in the way of FX other than some basic casino slots sounds when you spin. The Toucan, meanwhile is the game’s Scatter, and three or more across the reels triggers a free spins round with 20 spins awarded. Spins can be re-triggered and there’s a 2x multiplier attached to all wins. For a simple slot it’s good to see you at least get a bonus round, and for 20 spins with a 2x multiplier that should be enough to tempt even the most free spins-weary slots fan. If, however, you’re after more simple slots fare from Amaya, check out their bright 'n’ breezy Mexican-themed Chilli Gold game or their voodoo-themed game, Juju Jack, which has Expanding Wilds included.